The traditional method of bulk exporting of copper concentrate uses trucking, warehousing and ship loading conveyor systems, all of which result in small material loss. To complement its operations, Codelco started from the beginning and designed a whole new system that completely encloses the material from the pit to the hatch of the ship. The new process, engineered with the support of equipment suppliers, encloses the expensive copper concentrate in a sealed container. The equipment, specially designed for the project in cooperation with suppliers uses some innovative new ideas. The copper concentrate is sealed in a purposely designed box with a lockable lid. Once in place at the mine, the only time the lid is removed is by the lid lifter on the revolving spreader prior to rotation at the bottom of the ships hatch. During the tipping process, the hatch is sealed with the final piece of clever design, with a hatch based dust suppression system catching any rising dust. The traditional method of bulk export involves multiple transfer points, from truck to train, to warehouse then by conveyor to a bulk loader into the ships hold. At each of these transfer points material is lost. When your commodity is selling for more than 3,000 dollars per ton, the financial loss can add up to millions of dollars. Traditional bulk loading requires large amount of investment in engineering, design and construction, implementation and maintenance. Some bulk terminals cost more than 100 million dollars to set up. The new innovative way CODELCO, in conjunction with Puerto Angamos implemented a way to handle its copper concentrate was through the Containerized Bulk Handling (CBH) system, sealing the material in a container from pit to ship. In the mining industry, this is the first of its kind in the Americas. The copper concentrate is loaded and sealed into special ISO twenty foot containers at the mine; it is then transported to the port’s yard, stored like any other container and then loaded right into the vessel’s hatch with existing terminal equipment. The only new equipment is the purpose designed revolver from RAM Spreaders. The CBH process is simple and effective, efficient and most of all, clean and friendly to the environment at a very low cost. The copper is not exposed to the environment, even when it is released at the bottom of the vessel’s hatch by the revolver spreader. Dust is created when energy is added to dry bulk materials. 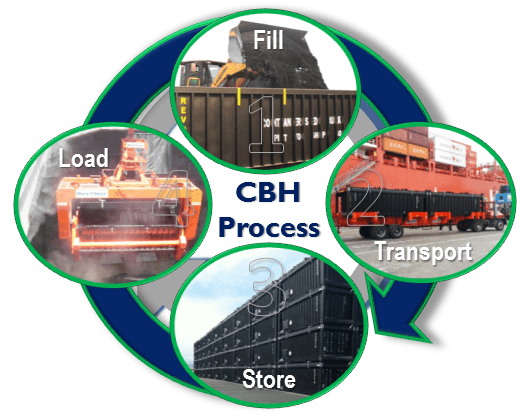 The CBH process is engineered to prevent energy from impacting the material at all stages of the process. Energy which creates dust can be the wind on a train wagon, the wheels of a tipper truck or a bulk loader dropping material from a great height and displacing air in the ships hold. Being clever in design, using the CBH process allows lids to seal the container at the mine and is kept sealed during transport and storage. The container is only opened after being lifted at the port before it is rotated into the bottom of the ships hatch. Revolving the container at the bottom of the hatch adds minimal energy and creates minimal dust. The team has added a further environmental protection step, by sealing the ships hatch to stop any escape of fugitive dust emissions by a hatch mounted dust suppression system. Most of the equipment required to successfully implement a containerized bulk handling system already exist at the mine site and port. This includes forklifts, reach stackers and cranes. For ports that do not have their own mobile or ship to shore cranes, the revolver spreader also comes in a lightweight version, so it can be used on ship cranes. In the case of Puerto Angamos, it has 2 of the most advanced harbor mobile cranes in the port industry. The only major additional equipment required in this operation, is the revolver spreader and the containers. This is a fraction of the investment made in traditional bulk terminals. The whole solution can be up and running within six to nine months from the time a decision is made. The system has also seen fast load rates with other projects using the revolver spreader for iron ore, loading at 2,000 ton per hour per revolver. Very cost effective indeed. Puerto Angamos have implemented a dust suppression barrier, fitted around the ships hatch as an additional measure, to protect the environment and the port personnel’s health at the terminal while loading the vessel. The system completely covers the entire top of the hatch with a fine fog. As any fugitive dust particles rise up from the hatch, they collide with the heavier water particles, then join together and fall to the bottom of the hatch. Likewise, the misting system does not have any adverse effect on the product been handled. This is a key and critical feature in terminals where dust control is of the utmost importance at the pier where other operations are being handled at the same time. In most cases, the outside observer will not be aware bulk is being loaded. On the financial side, in conventional operations without a misting system, the loss of product over a length of time is significant. A very important service Puerto Angamos can provide by using this containerized bulk handling solution is their ability to perform copper blending right in the hold of the vessel, creating a clean blend of copper concentrate. As some batches of containers may come into the terminal with various degrees of moisture, they can be segregated at the yard by a color tag or numbering system and then loaded into the vessel as desired, to meet customer requirements. It is interesting to note that this system is fully mobile. The port operator or the mine company can move the operation (revolver spreaders and containers) to any other site within or outside its borders. Investment is therefore not lost when operations end, it is enhanced and protected. Along the same line, this process may creatively add significant new cargo traffic and revenues to the port. Puerto Angamos has implemented two twenty foot revolver spreaders with containers having a payload of 30 tons. With two mobile harbor cranes, 1,100 tons per hour is achievable. All of this possible, using existing infrastructure and equipment. In summary, we can say the containerized bulk handling system is a low capital investment, with a faster time to market and virtually no dust from the lid and misting system, it caters for most types of bulk products. In essence, CODELCO has changed the way the bulk industry works in the Americas. It has set up a benchmark to a more efficient and environmentally friendly way of safely transporting, storing and loading copper concentrate into the vessels.